Disclaimer: Though another blogger claims I did this research for her, that is not true. If you are one of the people who found this post due to the writings of another blogger, please read this post or contact me privately for more information. 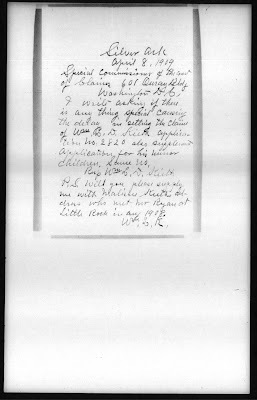 Yesterday a friend contacted me and asked me to look up the Guion Miller application of William Loranzo Dow Keith. 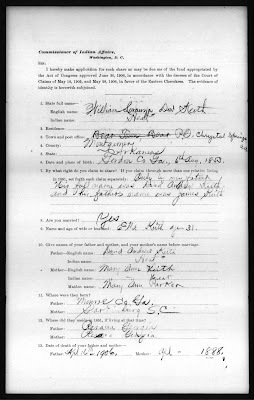 The descendants of William claim to descend from a Cherokee named Crane Eater based on this application. Almost immediately, I knew this was a family myth that needed to be dissected and explained. 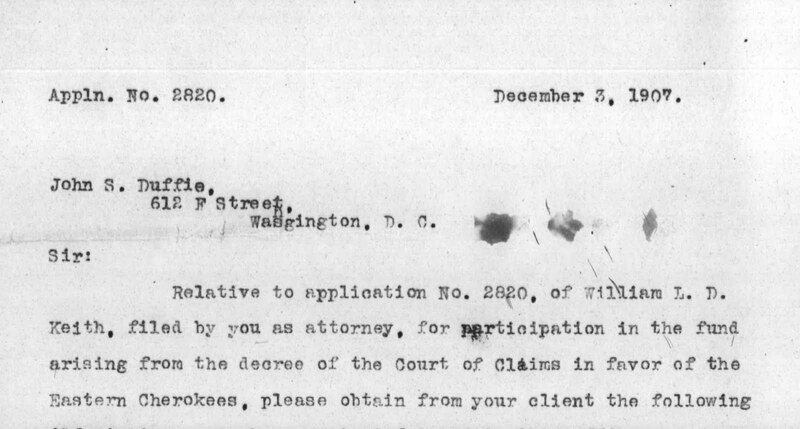 The first thing I noticed about the Miller application filed by William was that it was rejected. The reason - "It does not appear that any ancestor was party to the treaties of 1835-6 or 1846. Nor does it appear that any ancestor was ever enrolled. Shows no real connection with the Eastern Cherokees." How much clearer can it get? Guion Miller said these people had NO REAL connection to the Cherokees. 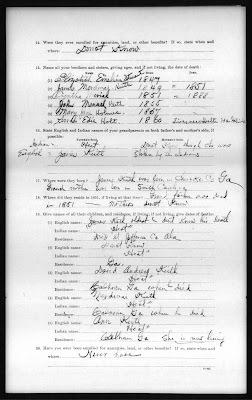 How is that sound genealogical evidence of Cherokee ancestry? Having the application rejected is usually not good enough for some people to accept they are not Cherokee, so I kept looking. 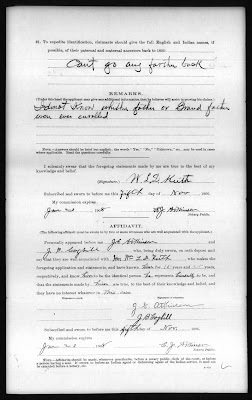 Next I noticed William reported his grandfather's English name as James Keith and Indian name "Heat", but later, after giving testimony for more information, William then threw the name Crane Eater out there. "But if he wasn't Cherokee, where would he get such a name?" you might ask. Let me tell you. William was born in Gordon County, Georgia. Guess what is in Gordon County, Georgia? A town/community named Crane-Eater as well as a creek with the same name. Notice William didn't pick just any Cherokee name to say he descended from, but instead, something he was familiar with - a place named after a Cherokee and near where he had previously lived. And, we know he knew about this place because he actually mentions it in his Miller application. Also, William changed his story from the time he filed his application to the time he was questioned for more details about his grandfather. The first time he gave information about his grandfather, he said his grandfather's English name was James Keith. In the testimony for more information, he said, "My grandfather was a full blooded Cherokee. His name was Crane Eater: that was his Indian name. Don't know that he ever had any English name." Now why did the story change? Is it possible William forgot he had already reported the English name (and supposed Cherokee name) of his grandfather and thought this new story sounded better? Whatever the reason, the stories don't match and something is amiss. William also says his grandfather lived with the Indians until he died, but this can't be true. The reason? Because we would assume a father was living in the place his children were born. 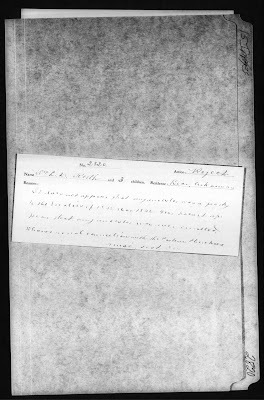 William says his father, David A. Keith, was born in Monroe County, Georgia in 1807. 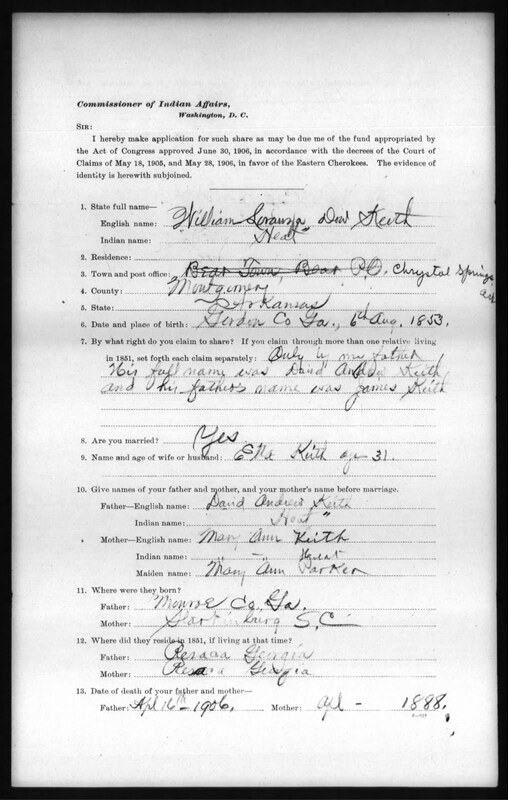 According to the 1860 US Census, William's father, David, was 35 years old. This means he was actually born in approximately 1825. At that time, Monroe County, Georgia was no longer Indian land. It had been ceded by the Creek Nation in January, 1821. When Indians ceded land to the government, they moved off that land. This means white people lived there, not Indians. So, if David A. Keith was born there, his father (William's grandfather) was probably living there and not with Indians as William stated. 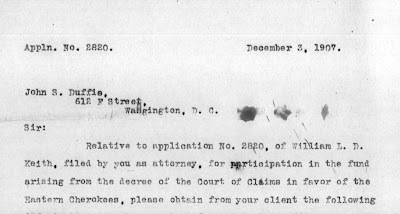 Another thing I noticed about the Miller application filed by William was that he had a lawyer working on his claim for him. Anyone who has read very many of the Miller applications is aware that it is rare to see a real Cherokee use a lawyer to get their money, but extremely common for a white person who is eventually rejected to use one. Cherokee genealogists are also aware of the fact lawyers were traveling around the country telling people the Cherokees were going to get a lot of money and for a small fee, the lawyer could help people get some of this money because the Cherokees had no records. The only people who got rich in this was the lawyers because the Cherokees had a lot of records and the fraudulent applications were nearly all rejected. Something else that got my attention in this application was twice William wrote letters to the commission asking how long it would take to settle his case. 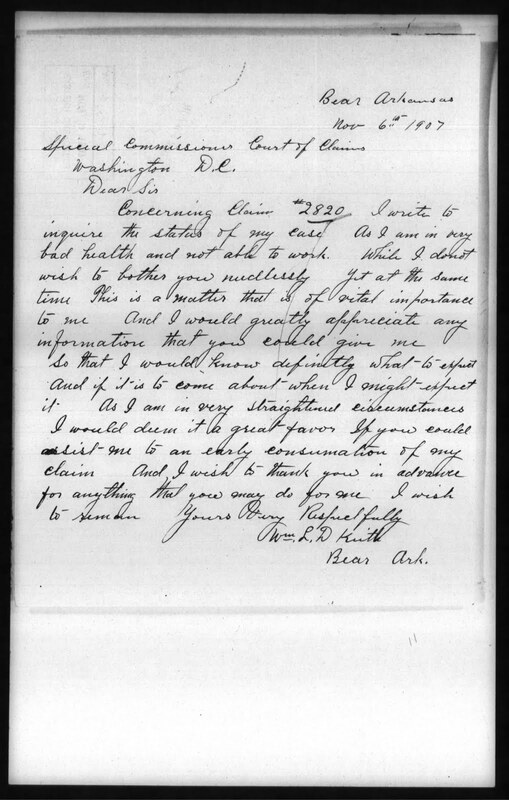 In one letter, he even said, "I write to you to inquire the status of my case as I am in very bad health and not able to work......This is a matter this is of vital importance to me.............As I am in very straightened circumstances I would deem it a great favor if you could advise me to an early consumation of my claim." These sound like the words of a desperate man who needed money badly. It would not seem far fetched to think he would try to get it by saying anything he needed to say. After all, there was no punishment for filing a false claim, you just got rejected. But, if you could get admitted, then you got money. So what was there to stop people from trying to get this money? Haven't we all heard the old saying, "Hard times call for drastic measures"? After moving from the Miller application, which should have been more than enough to dispel the family myth of Cherokee ancestry, I found more information. 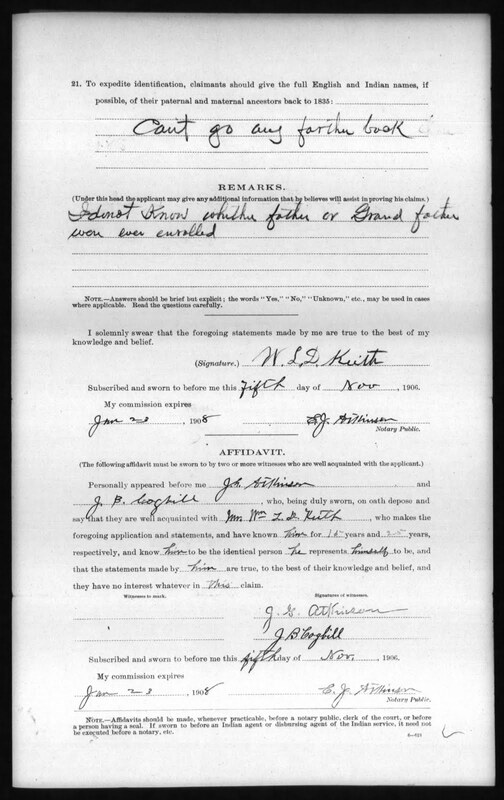 Apparently James Keith*, the great grand uncle of William (the uncle of his supposed full blood grandfather, James Keith/Crane Eater), was issued a passport to cross Creek Nation (Georgia Passports, page 229, dated Thursday, 17 November 1808). Guess what? Indians didn't need passports to cross Indian land. That is something white people needed. Since William claimed his grandpa was full blood, that would mean great grand uncle would probably have been at least some degree of Indian. If William's claim's were true, then why the need for a passport? 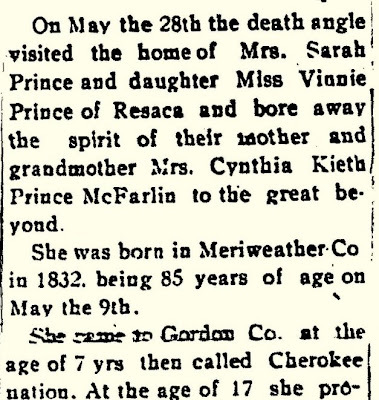 Since she was born in 1832, per her obituary, this means she moved into the Cherokee Nation in approximately 1839. Guess what happened in 1838-39? The Cherokees were removed and whites took over their homes and property! Now if James Keith was Cherokee, a full blood Cherokee, why would he move his family INTO Cherokee Nation as the Cherokees are being forced out? He wouldn't. The only people who moved into Cherokee Nation at that time were whites who were waiting like vultures to take Cherokee homes and property as soon as the army removed the Cherokees! People often don't believe me when I say the very people who forced our ancestors off their land and took nearly everything else they had now have descendants who are trying to steal the last thing we have left -- our very identity. This family is a prime example of it. First, they moved onto Cherokee Nation lands as soon as the Cherokees were forced out! Then, they filed a claim for money due the Cherokees for that very same land! And now they claim to be Cherokee based on that rejected application! Are you kidding me? Why don't they just spit in our faces? What gives this family the right to claim to be Cherokee when there is no evidence to support it, yet so much that suggests they aren't? I would like to say this is an isolated case and it doesn't happen very often, but unfortunately, it happens all the time. There is NO excuse for it. I only looked at this family for two hours and found all this information. If I can find this in that short amount of time, then why can't the descendants who have been looking for years find it? The pieces of the puzzle are all there. They just have to put them together. You can't change a family to Cherokee when they weren't. The evidence speaks for itself. More about the Keith family here. Full documents used for the above sources are found below. Great post, as usual. 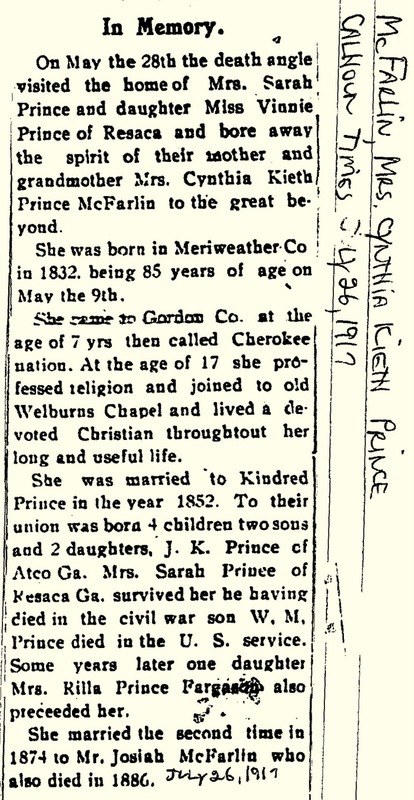 I'm so happy that this information is finally out there, because so many beginning genealogists think that one needs some extraordinary talent to research Cherokee ancestry; when in fact it's as easy, if not easier than researching white families...WHY? Because the Cherokees are so well documented. In just a few hours you can dispell most of the family lore...You just have to resolve to put aside the family "stories," and go with the data staring you in the face. Dates, places, names, and historical fact do not lie. Wonderful post! I always enjoy reading your excellent research material. However, not all cases are so easily solved. There are exceptions. Perhaps you can assist me in researching my family? I would like your expertise with my family. Let me know and I will give you the details. I would be happy to look at your family, mdfreels. Post the information and I will take a look for you and let you know what I find. Okay. In my blog, I have posted a couple of pages, but I will see if I can post some more, so that you have more information to go on. My case is similar, my Smith family applied for the land allotments but were rejected. 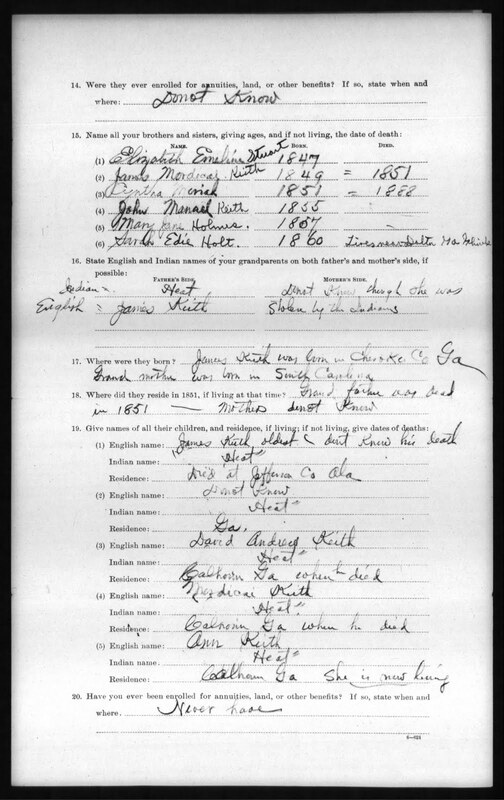 The application doesn't say they were found to be not Cherokee, but they were not found to be registered in the rolls and thus, did not have any proof. Anyway, I will post the application papers and let you look at them and then post a link to them on my blog. Thanks for the help. Okay. Here is a link to my blog page. I have tried to document everything about my family. I do not have much on this particular line. The documents seem to indicate there was Cherokee blood. There were some other pages and I will see about scanning them and posting them to my blog as well. Ofcourse John R Gourd was a Cherokee who lived in Tahlequah and was a member of the National Council. I seriuosly doubt he would have lied and pretended that my ancestors were Cherokee. Now I realize that it doesn't mean I can call myself a Cherokee by blood. However, I'm happy with being a descendant of Cherokees. This is just one of three lines that I descend from in which I have Cherokee blood. 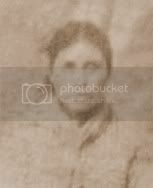 And I have an ancestor who was Choctaw, Margarete Ainsworth. So, I wouldn't call myself a "wannabe". But I also recognize the fact that I'm not a member of any federally recognized tribe and therefore out of respect for those Cherokees, I no longer call myself a Cherokee Indian, but a descendant of Cherokees (I used to however, so you may read older articles reflecting that idea). First, let me say I am looking because you asked and I am trying to be helpful. 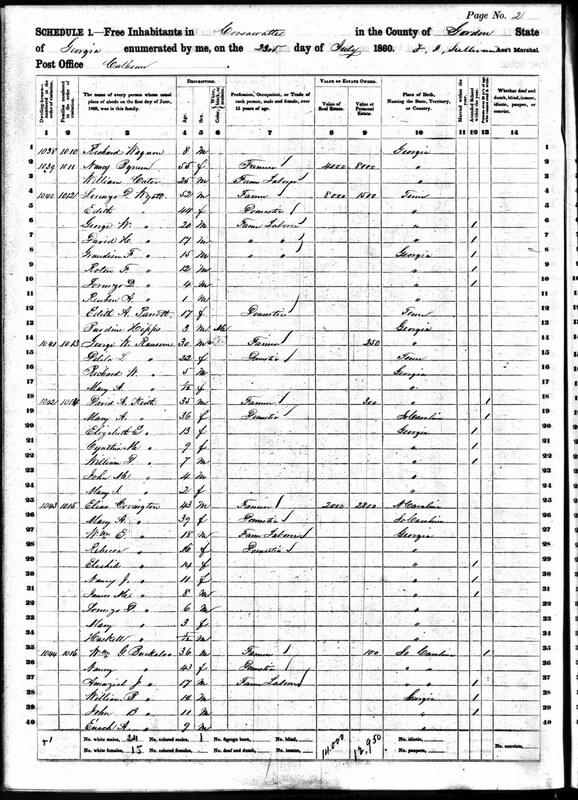 Despite the testimony from Mr. Gourd, one thing that concerns me is that none of your ancestors are found on the 1835 Census of the Cherokee Nation. 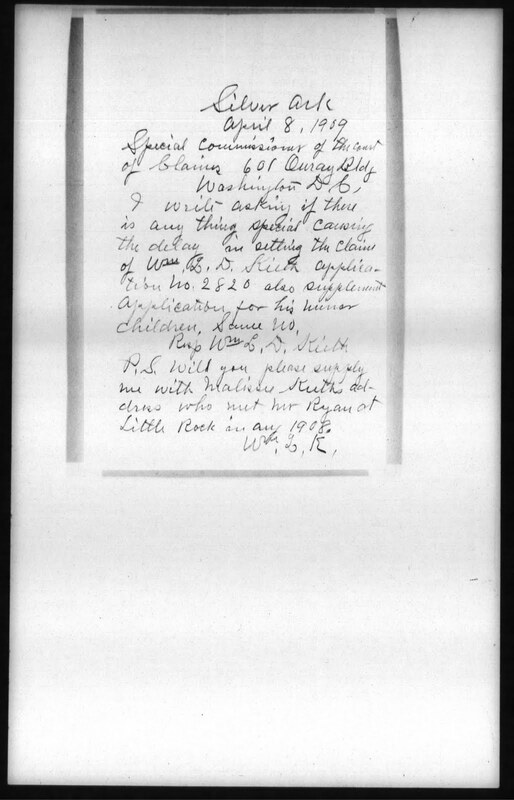 Other than the testimony from Mr. Gourd, what other documentation do you have that supports the idea your ancestors were Cherokee? As far as I can tell, they no longer lived among the tribe by 1835. They lived in Jackson Co., AL in an area that was once reserved for reservees (not sure if I said that right). So for all purposes and reasons, my ancestors were no longer members of the Cherokee Nation by 1835 and therefore probably should not be called Cherokee at all even though they certainly carried the blood. 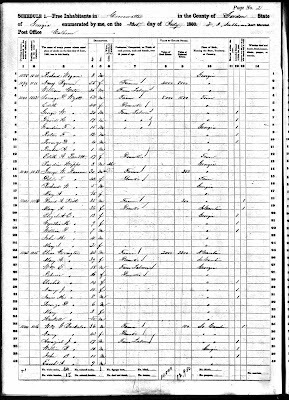 However, they cannot be found on any federal census record either until 1850 Johnson Co., AR. We have always heard that when they had left the tribe, they kept a fairly low profile because of their dark complexion. I won't say they hid out in the mountains, because I really don't think they did. But they seemed to avoid the census takers. 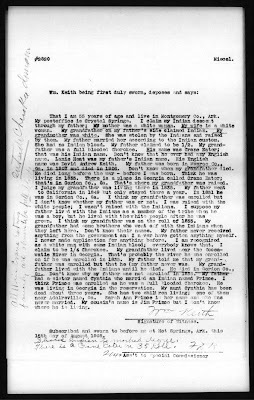 I really wish I had other documentation (because it seems that all who would call themselves descendants of Indians seem to have to prove to everyone they are), but the deposition is the only thing that I have other than family traditions. I have very few photos of these ancestors. So I really can't even use pictures as evidence. Really, other than my word and honor and the deposition, there is absolutely no evidence. This is not like my Choctaw ancestor, Margarete Ainsworth, who on her death certificate it states she is American Indian. 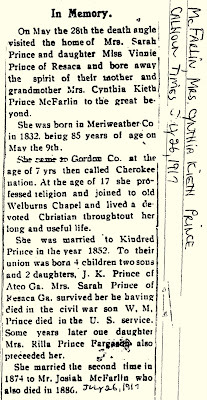 Plus because of her heritage she was not allowed to buried in the Cordell Cemetery. In the deposition, it lists some other names other than Smith, I think Gallymore and Lee. Those are also old Indian names (I have read about them in the Tennessee Archives). Do you know where I might find something about them? It would probably be difficult to find much before 1800 and I would understand if you couldn't really help in this area. I just wish I could find any of them prior to 1850. I appreciate your help though. 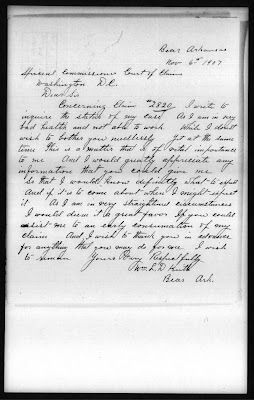 Have you checked the journals the missionaries to the Cherokee kept? 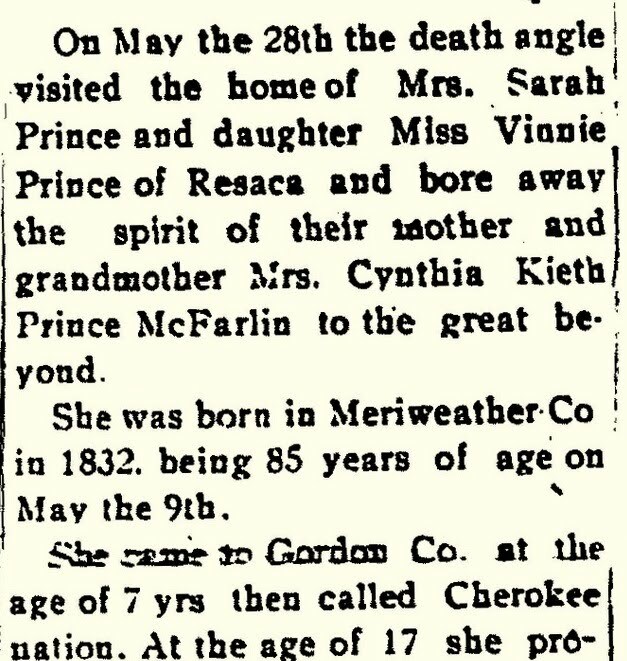 Not all Cherokee families are mentioned but some were. 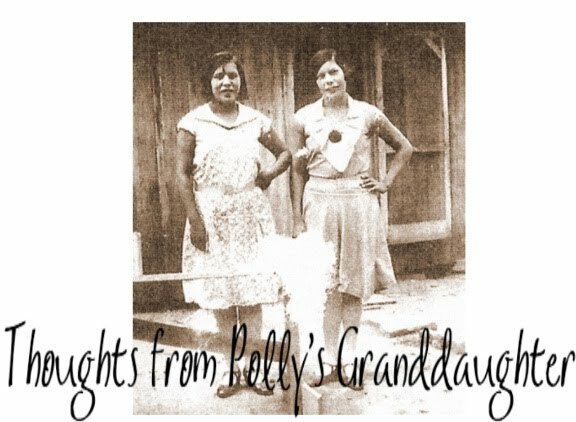 Because missionaries entered the Cherokee Nation in the early 1800s, they give us insight into people, family connections, etc...prior to 1835. There is no guarantee you will find anything, but it might be worth a shot to research those journals. The Brainerd Mission was one. The Springplace Mission was another. Thank you so much for your help. I will most certainly check out the journals. Keep up the good work on your articles. I found this post through a google search. Also for a keith family member. His name is William Andrew Keith. I have no idea of Indian ancestry. I honestly doubt it. I do have one question though. In 1900 if someone were living in "Chickasaw Nation" in Oklahoma would they not have to have a travellers card as well?